Costume by Melissa S., Montgomery, TX. I had been trying to think of some original childrens Halloween costume this year. I had bought several 3ft. balls for my son that were like blow up beach balls on the inside and had a cloth cover over the outside. I paid $2.00 for each. We choose to use the soccer ball. On several occasions my son had been accused of being a ball hog and the light went off in my head. I made him a pig tail by curling up two joined Black pipe cleaners. And pig ears with a head band and black felt sprayed with fabric stiffener in the shape of pig ears and also cut out the shape of a pig nose and secured with elastic around his head. We stuffed the ball with polyester filling after cutting out arm and head hole. He won first place for this original ideal and also won most original. The idea came to me late at night, as great ideas often do. My daughter was really into soccer and wanted to wear her soccer uniform as a childrens Halloween costume. 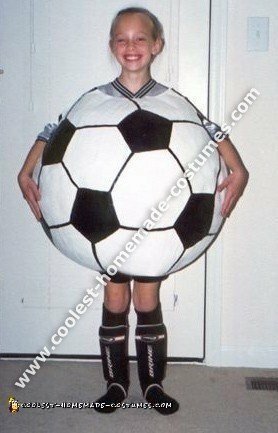 Well, I knew I could do better than that… instead of a soccer player; she would be the soccer ball as a childrens Halloween costume. After a long search for a 3′ diameter balloon, I used an air pump to blow it up. I then proceeded to do a very messy job putting on two layers of papier mache. Worried that the childrens Halloween costume would not hold up, I then put a layer of masking tape on top of the papier mache. Then I put on 2 more layers of papier mache. After the childrens Halloween costume was completely dry, I spray-painted it with 2 coats of primer. Next came 2 coats of white semi-gloss paint. The hardest part was painting on the black shapes to make the costume become a soccer ball. After the black paint dried, I cut the end of the balloon to pop it and let the air out. Well, as the air came whooshing out, the costume started collapsing on itself. Mind you that this was the day before Halloween and I started having a heart attack!!! Fortunately, I was able to pull the balloon out and push the costume back into place. Next, I cut out the arm and head holes. I made the hole where I cut the balloon bigger so it could fit on my daughter’s body. Here again, I became worried that the costume would not hold up. I put masking tape around all the openings and went back and painted over the tape so it would blend in with the rest of the childrens Halloween costume. 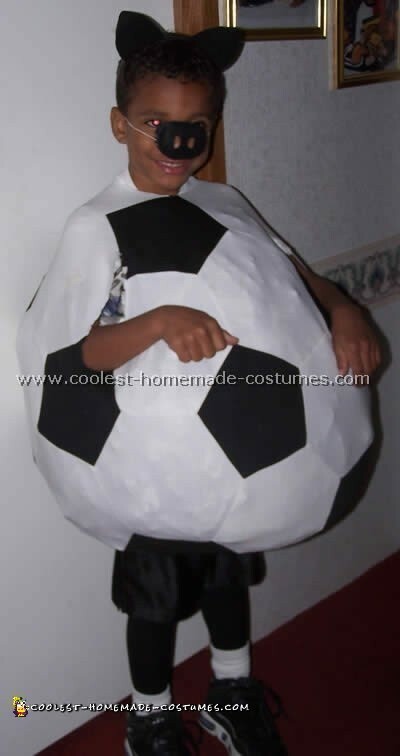 It took several weeks to make the soccer ball childrens Halloween costume. It had to dry between each layer of papier mache and each coat of paint. I had fun making it and my daughter LOVED it! !